The scale, patches of color, and illusion of rippling water simultaneously give this painting a sense of immediacy and solitude. Fellow painters praised John Twachtman's ability to capture momentary effects, arrange forms and color into balanced compositions, and depict the sensations associated with the region or season. Unfortunately, the artist did not sell many of his works before his sudden death at the age of 49 during a summer stay in Gloucester, Massachusetts. Twachtman is usually classified with Childe Hassam and American Impressionism, but his initial training was done in Munich 1875 to 1877 where bold color choices and deep shadows were the prevailing trends. 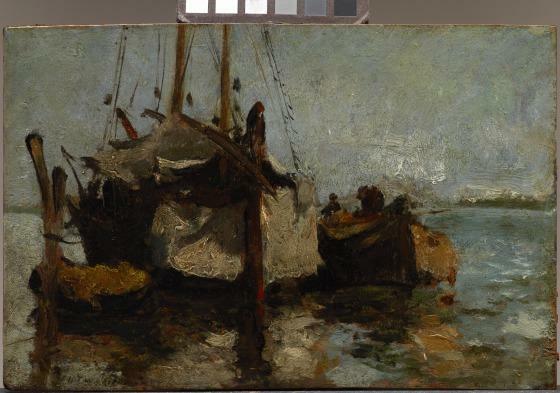 By the late 1880s, his palette lightened to the pastels and whites often associated with Impressionism. 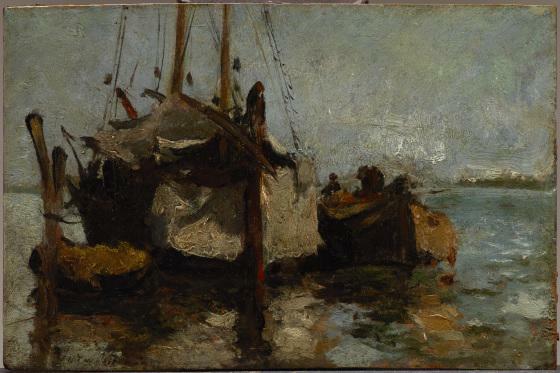 Twachtman rarely gave specific titles to his images, and providing them with dates is complicated because with few sales and no public expectations, he freely alternated his style and technique. Emily Schiller, DMA label text. Read a biography of Twachtman from the National Gallery of Art. View other works by John Henry Twachtman.